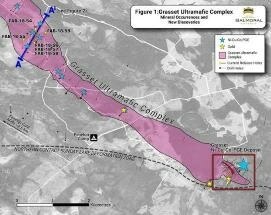 Balmoral Resources Ltd. has reported that drilling has been initiated to expand its new high-grade nickel-copper-cobalt-PGE sulfide discoveries within the central part of the Grasset Ultramafic Complex located in Quebec. Brazil Minerals, Inc. announced on March 25th, 2019 that the local mining authority had issued the Exploration Permit for its nickel, cobalt, and copper project that covers two mineral rights in an area of around 5000 acres in the state of Goiás, Brazil. Monterey Minerals Inc. (the “Company” or “Monterey”) is pleased to announce that has completed the purchase of the Cobalt Mountain Project and now owns a 100% undivided interest in the property. Champion Iron Limited has announced that it has reached a joint exploration agreement with Supreme Metals Corp. to access the claims situated on the Bloom Lake East Property. Declan Cobalt Inc. takes great pleasure in announcing that a compilation of its exploration efforts taken so far has led to the identification of deeper (<700 m) as well as shallow (<400 m) drill targets. Osisko Metals Incorporated is pleased to announce that it has signed an option agreement with Osisko Mining Inc to earn a 50% interest in the Urban-Barry Base Metals Project, a select package of 151 claims located within Osisko Mining's Urban-Barry claim group. International Cobalt Corp.(the “Company” or “International Cobalt”) is pleased to announce that it has received and compiled data from the Idaho Geological survey branch that had previously been confidential on the Company’s Blackbird Creek Cobalt Project (“Blackbird Creek” or “The Project”). MGX Minerals Inc. is pleased to report the Company has engaged Highbury Energy Inc. (“Highbury”) to assist in preparing a detailed process to extract metals such as nickel, vanadium, and cobalt from petroleum coke (“petcoke”).